The Park Service’s hired hunters are assaulting not only wildlife but the value systems of West Marin residents as disparate as ranchers, deer hunters, animal-rights advocates, and merchants. 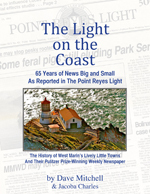 Until now, the administration of Point Reyes National Seashore Supt. Don Neubacher has managed to avoid most of the criticism it deserves by repeatedly giving out misleading information regarding the need for the slaughter, how quickly it would proceed, and what would become of the venison. 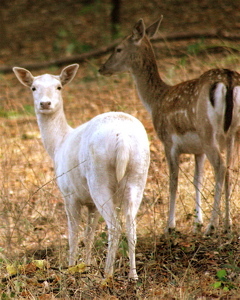 Until the press found out, for example, many fallow deer were left where they dropped, slowly dying of gut wounds. Axis-deer carcasses were carted off in Waste Management dumpsters, one garbageman has reported. Wildcare has organized an email petition drive to House Speaker Nancy Pelosi, Senator Dianne Feinstein, and Senator Barbara Boxer, calling for a moratorium. I urge readers of this blog to please take a few seconds to sign the petition by clicking here. I am devastated by the slaughter of the fallow and axis deer, and I’ve wanted to organize some kind of event that will allow the community a way to express our grief and horror. I spoke with Ella Walker this week and was moved by her story. She lives in the heart of Olema and has spent time in the National Seashore confronting the White Buffalo hunters. Other Olema residents have seen helicopters terrorizing deer out of gulches into the open where they could be shot. I sure would like to see the press embrace this story and stay on it until we can figure out how the Point Reyes National Seashore was allowed to eradicate axis and fallow deer when so many citizens are against it, including leading politicians. Park Superintendent Don Neubacher’s response to any query is that we all had our opportunity to comment. Did anybody really listen to our input or respect it? I don’t think the Point Reyes National Seashore was ever very concerned about the community’s feelings. 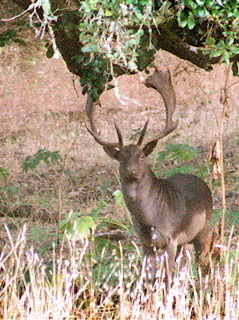 The axis and fallow deer are a part of our community, whom we have loved seeing as we go about our daily business. I don’t see them anymore and I miss them. Had the National Seashore not given the public so much misinformation, the public opposition up to now would have been far louder. We were told that the deer were not scheduled to be totally eliminated until 2020 and that there would be time for changing this approach to managing them during the intervening years. But already, the axis are virtually gone, as are a large percentage of the fallow deer. Trinka Marris, Richard Kirshman, and many other Marin County people have worked hard to stop the killing, and I, like Susan Sasso said in her letter a few weeks ago, thought this group would be able to carry the fight for us. However, the slaughter has been so fast and furious, and there has been so much deception that more of us need to be heard. Now that we are hearing the horrible truth about White Buffalo’s barbaric practices, it seems their contraception program is, in fact, merely one way they track herds to kill them. 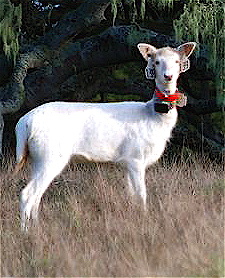 A fallow doe, her head jangling with a tracking collar and tags that pierce both her ears. While all this is supposedly to keep track of which does have received contraception, the tracking collars are being used by hunters to find and kill the does’ herds. Photo by Ella Walker. Many people in our community complain in private about the abuses they have witnessed but have remained silent out of fear of the park’s ability to retaliate against their business or the home and ranch they lease within the park. People who know the reality of the culling and contraception program need to speak out and tell the public and our political leaders what has happened to the fallow and axis deer. Silence is complicity when a holocaust surrounds us. Ella Walker has witnessed White Buffalo boss Anthony DeNicola, his clothes covered in blood, driving across the Vedanta Retreat, where there was not going to be any deer killing, the park had said. At the very least, White Buffalo appeared to be using the retreat as a staging area for killing deer nearby. A lot of information is coming out now about White Buffalo’s disturbing tactics in communities all across the country. I wish we could have had an opportunity to learn something more about them, to be a part of the process that determines life and death in our homeland. I thought West Marin’s concerns were supposed to be significant. Not only are we in West Marin part of the public that owns the park, we are a key part. The National Seashore is part of our community, and more than most Americans, we are aware of what is occurring within it. 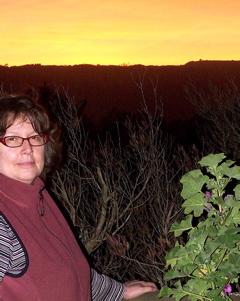 We in West Marin are its caretakers as much as the Park Service employees who get assigned here. And we demand a stop to the killing. I’ve lived here 35 years. This land and this community have been the love of my life, my healing place, my home. Now I wake every day with a pit in my stomach, knowing my animal friends have been terrorized and murdered. I feel sick. The Point Reyes National Seashore needs to know a very heavy toll has been taken on this community. We wish the park would have shown us some respect and considered our feelings about these innocent, majestic animals. Why the blitzkrieg after the park said it would proceed gradually? Like the deer, we as a community never had a chance. To the Point Reyes National Seashore I say, “Shame on you! Sparsely Sage and Timely is powered by	WordPress 4.9.10 and delivered to you in 0.291 seconds using 50 queries.